The service links India ( Nhava Sheva and Pipavav ) directly to Far East and China. Recent operating bulk vessels capacity about 60 vessels (as of Jul, 2016) is a truly largest volume amongst India. "K" Line also pioneered in commencing Car Carrier Service to Mumbai in 1986 with Imports and from 1989 with Exports. Currently we are providing the service to various customers involved in the industry of White goods, Machinery, Sanitary wares, Steel goods, Automobiles etc. Ports around the world have become increasingly strict as regards the quality of the vessels arriving and operating in them. “K” Line India Bulk Division is based in Mumbai and operates about 60 bulk carriers under the banner of “K” Line (India) Pvt. 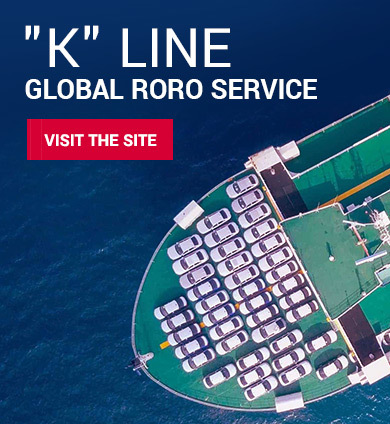 Ltd.
"K" Line has been a Pioneer in Car Carrier Operations since 1970 with the vessel Toyota Maru No. 10 inducted into “K” Line fleet as Japan’s first specialized Pure Car Carrier (PCC). “K” Line India has extended its Liner Shipping business to allied logistics activities with a view to provide a complete logistics solution under one roof to cater EXIM requirements of customer’s which covers freight forwarding, Custom clearance, transportation, warehousing etc. on pan India basis in other words door-to-door services. “K”LINE India has a fully functional Marine Division manned by four Master Mariners each with a backing of decades of experience at sea and ashore combined, in the Maritime field. “K"LINE (INDIA) PRIVATE LIMITED, a joint venture company between global Japanese shipping & logistics company, Kawasaki Kisen Kaisha Ltd., Tokyo, Japan ("K"LINE) and leading Indian shipping agency, J. M. Baxi & Co was incorporated in Mumbai, India on April 23, 2008. © Copyright 2016, K"Line (India) Private Limited. | Web Design By Image Online Pvt Ltd.